4 ton gantry crane mainly has six different kinds. They are the traveler gantry crane 4 ton for sale, BMH electric hoist semi gantry crane 4 ton for sale, BMG type double girder 4 ton gantry crane for sale, MH type electric hoist single girder 4t gantry crane for sale, MHH model single girder gantry crane with truss structure, and high standard European standard electric hoist 4 ton gantry cranes. Launched in 1960s, the leader 4 ton gantry crane manufacturer in China can guarantee high profile 4 ton gantry crane components and cheap price that fifth less than the other 4 ton gantry cranes suppliers. Portable gantry crane 4 ton refers to the a-frame gantry crane, which can be move easily and quickly anywhere you want. We will use the I-beam as the traveler 4 ton gantry cranes’ main girder to support the whole gantry cranes’ weights and also as the move rail for electric hoist fixed at gantry crane 4t. At the same time, the universal wheel load as the important toll to make gantry crane 4 ton to move all- around in earth. Usually, the traveler gantry crane 4 ton in our company has the 0.5-10 ton lifting capacity, equipped with electric hoist can lift the weight from 500-5000kg, which will effectively reduce manpower cost and raise work efficiency. Due to compact steel structure, outstanding appearance, cheap price and convenient operation, the traveler gantry crane 4 ton will be the first choice for owners of garage, small factory, or just use in family. Different with the traveler mobile gantry crane 4t, the BMH type electric hoist semi gantry crane for sale only has one side support leg; the other is working on the wall. Considering the stable and safety, the BMH type mainly will be designed in box structure. Usually, our company’s high quality 4 ton gantry crane in BMH type has 2-16ton lifting capacity, 5-20m span, 6-12m lifting height. Of course, if you have another requirement about BMH single girder 4 ton gantry crane, we are also capacity to offer you custom service. Not like the BMH type electric hoist semi gantry crane 4 ton, the MH type single girder gantry crane has two support legs and can fixed on any working place. The MH lifting capacity can reach 20 ton, and holds 30m span. 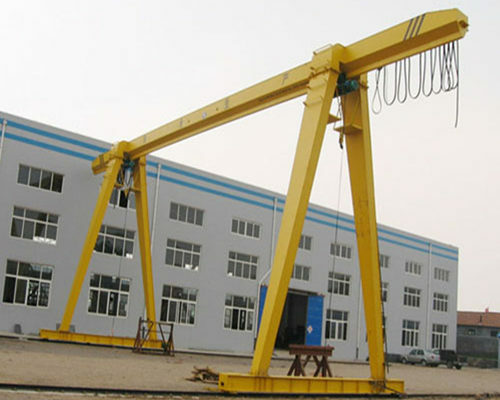 According to different length of span and lifting height, we will design our MH type 4 ton gantry crane in two models. One will have cantilever, while the other hasn’t. And there is another kind of 4 ton gantry crane very similar with MH type single girder gantry crane; it’s the MHH type truss structure 4 ton single girder gantry crane. One most different is the truss structure in MHH, which is very suitable for the working environments with big wind. This reasonable truss structure design ensures high safety and stability. Owns higher work duty A5, and long span 30m, the high standard European type 4 ton single girder gantry crane fit for busy and heavy work well. Due to high quality and modular design, the European type 4 ton gantry crane will also reach less maintenance or even zero maintenance. All kinds of 4 ton gantry cranes in our company will have factory price that fifth less than the other gantry crane manufacturer, and we also offer you a series free service, just send your free inquiry now. The unique geographical advantages offer the fastest delivery. Close to the Beijing-Guangzhou expressway and the Zhengzhou international airport, we ensure a fast delivery in three days. According to the data from the past six years, we get zero-error in delivery. Strong technology support. during more than one century’s development, our company has been a leader in crane industry, owned 6 factories and more than 2000 employees, among which includes almost 800 engineers that provide professional and specific knowledge for our customers anytime anywhere. it‘s convenient for our customers to install and maintenance their gantry crane. Just send your free inquiry for 4 ton gantry crane for sale now.